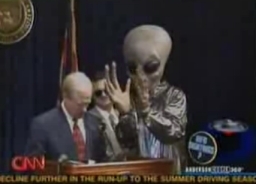 Fife Symington, former Governor of Arizona is a rare individual on UFO Watchdog. He gets an entry in both the Hall of Fame and the Hall of Shame. The Shame: During the Phoenix Lights incidents when a great many people were witnesses, many of whom were quite concerned, Symington held a press conference in which he said the mystery had been solved. Out walked his Chief of Staff in an alien costume (left) to much laughter from the audience. He stated that the audience was much too serious. His stunt did not go over well with many of the citizens. Symington said he was trying to avoid a panic and thought a light-hearted approach would take the edge off the situation. The Fame: Several years later Symington, a fighter pilot in Vietnam, admitted to seeing the Phoenix Lights himself and refuted the military claim of flares. he appeared on Larry King Live and moderated a National Press Club meeting on November 12, 2007 sponsored by Leslie Kean of the Coalition for Freedom of Information and James Fox, the documentary film maker of "I know what I saw" and "Out of the Blue."